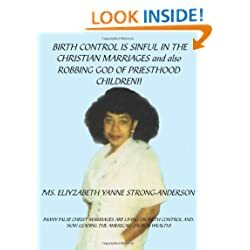 Birth Control is Sinful in the Christian Marriages and also Robbing God of Priesthood Children!! Despite being written entirely in BLOCK CAPITALS, this self-published work conveys its message elegantly. In fact, you don't even need to read it to understand the main argument being put forward. True, by avoiding this book you will miss out on the precise location of the heretical surfboard worshipped by the British royal family and the sinister significance of Abe Lincoln's unholy quadrille. You will also miss out on the explanation of why the Hairy-Eared Dwarf Lemur is really God's own tree-dwelling angel-on-earth and on the coded instructions showing how to grow a prize-winning mushroom, which the author cunningly gleaned from a close textural analysis of St. Paul's third birthday card to the Corinthians.